It’s game-time! Apple just announced its long-awaited take on a smart speaker, completing the smart speaker triumvirate along with Google and Amazon. The gadget itself isn’t particularly remarkable, but it is an Apple gadget. That’s a big deal for a lot of people. The new Apple HomePod is a lot like its competitors: Amazon Echo and Google Home. You can activate it with a wake word—“Hey Siri”—and ask an artificially intelligent assistant, Siri, to play music. The HomePod comes with an array of six microphones so that it can pick up your voice from any direction. Apple promises the Siri team has made some updates so that the AI works better for music requests. Apple has also make HomePod a “home assistant” that can answer all kinds of questions and tell you about the weather or the traffic. HomePod also works like a smart home hub for all HomeKit-compatible devices. So now you can ask Siri to turn on the lights or lock the door without moving a muscle. You can also control your HomeKit devices remotely now, using the Home app on any iOS device. Yes, you can do the same thing with an Amazon Echo or a Google Home, but remember: this is an Apple gadget. Where Apple hopes to stand out in its late entry to the smart speaker market, however, is by putting extra emphasis on the speaker part of the equation. 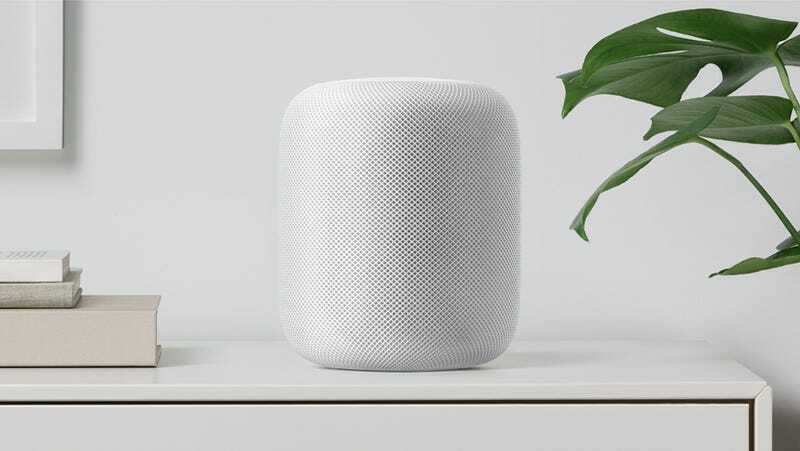 While the Echo and Home aren’t known for great sound quality, Apple engineers—presumably with some help from Beats engineers—built the HomePod for high-fidelity audio quality. That includes a “seven beam-forming tweeter array,” “precision acoustic horns,” and “directional control.” Apple says that you don’t need to know what that means but the seven-inch-tall speaker sounds really great. There’s also a “virtual surround sound” feature that helps the small speaker fill up a room with your sick jams. In other words, Sonos is now an Apple competitor. That’s all fun and games until you start to wonder if Siri is now spying on you and your loved ones. Apple says that “only after ‘Hey Siri’ is recognized locally on the device will any information be sent to Apple servers, encrypted and sent using an anonymous Siri identifier.” It’s unclear what happens to the data once its on Apple’s servers. The new speaker will cost $350. It will come in white and space grey and will start shipping in December. And even though it’s not as feature packed as the latest Echo, you’re probably going to want it, if you’re an Apple fan. Even if you’re not, it’s a fine-looking gadget.